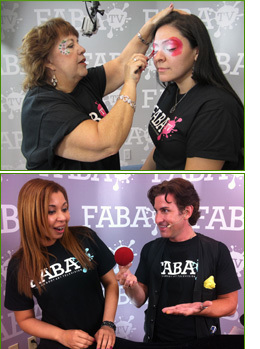 On December 2nd the artist at FABA will be doing online web classes for free all day long! What is FABA? It is an online community where face painting artist teach classes, there are beginning, intermediate and advance classes and it is much more then just face painting a flower or a star. I refer to the face painters as artist because that is what they are, imagination and a little creativity bring to life fantastical creatures and incredible monsters. This is an all day event to raise money and awareness of homeless Teens of Covenant House and 100% of proceeds will go to this charity. Yay! for the fundraising. I love the pics! Enjoy your vacation. It sounds lovely, what with the writing and the shopping and all.